One of the most common questions new parents have is how soon should they should start to look after baby’s gums? There’s a staggering amount of advice and tips on caring for a newborn, but gum care isn’t typically commonly listed. It’s logical to think that gum care should start when baby develops their first teeth. However, many experts suggest that it should begin long before this. 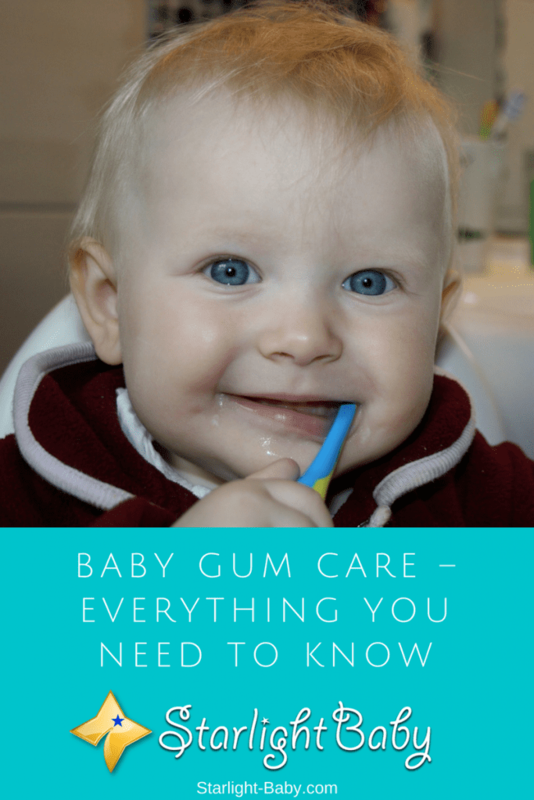 If you’re struggling to find adequate baby gum care information, below you’ll discover everything you need to know. When Should Gum Care Start? Ideally, you’ll want to start caring for your little one’s gums as soon as they are born. This is because although they might not be showing, baby’s first teeth are already in place behind the gums right from birth. They start to show at around six months of age (or even earlier), but it’s still a good idea to look after the gums before this happens. You won’t need to use a toothbrush until the teeth are visible, so to start with it is best to use a soft cloth. It only needs to be dipped lightly in water, before being gently rubbed across baby’s gums. Make sure the cloth is only a little damp, rather than soaking. This should be done at least once a day, but if you want to protect baby against gum disease, it’s best to do it after each feed. Alternatively, you can use a piece of gauze instead of a soft cloth if you’d prefer. Following these simple steps each day can help to eliminate bacteria and in turn prevent plaque build-up which could potentially damage baby’s first teeth once they come through. As well as helping to prevent gum disease, starting to clean baby’s teeth early on will also help make it easier to transition to using a toothbrush at a later date. Your little one will already be used to having their mouth cleaned so they’ll be less likely to kick up a fuss when you do start to use a toothbrush. When Should Babies Switch To A Toothbrush? You should only start using a toothbrush once baby’s first teeth have popped through. It’s also important to note you should use a soft, specially designed infant toothbrush rather than an adult toothbrush. It should have a fairly large handle, a small brush head and have a soft bristled design. Once you’ve got the right toothbrush, it’s then time to find the right toothpaste. Now, you don’t really need toothpaste for the very first tooth. However, once a few have popped through the gums, it’s worth using a very small amount of toothpaste to help keep them clean. You’ll almost always want to choose a toothpaste which contains fluoride. This is because Fluoride helps to make the teeth stronger, while also helping them to become resistant to bacteria and acid. You’ll only need to use a very small amount, similar to a grain of rice, until your baby reaches the toddler stage. Then you can upgrade to a pea-size amount. Be wary when you’re choosing specialized baby toothpaste as not all of them contain fluoride. How Should You Brush A Baby’s Teeth? When you’re just starting to clean baby’s teeth, it’s important to brush gently. Their little gums will likely be quite sore, so if you brush too hard it will cause your little one a lot of pain and discomfort. This in turn will lead them to develop a fear and dislike of having their teeth cleaned. You should gently brush both in front and behind the tooth. If you’re lucky enough to have a docile baby, you can also brush the tongue. As long as you’re only using a very small amount of toothpaste, you don’t need to rinse it out. Once the bristles of the toothbrush start to look a little worn, it’s important to replace it with a newer one. So, what about flossing? Well, you’ll typically find the first baby teeth are spaced quite far apart. This means the toothbrush alone should dislodge any bacteria and plaque. It’s only when the surfaces of the teeth start to touch that you should consider adding flossing to your baby’s daily gum care routine. Do I Need To Sign Baby Up To A Dentist? If you’re cleaning baby’s teeth yourself, does this mean they don’t need to be signed up to a dentist? No, just like adults, babies should have regular trips to the dentist just to ensure their teeth grow strong and healthy and to detect any potential problems early on. After all, you brush your own teeth twice a day, but you still need to go to the dentist for check-ups. It’s recommended by the American Academy of Pediatric Dentistry that all children should visit the dentist after their first tooth pops through. Ideally, you’ll want to sign baby up to a dentist within six months of this happening. Up until this point, you should find that your little one’s teeth are checked by their healthcare provider at each check-up. If your baby has an increased risk of developing cavities, they should also apply a fluoride based varnish to the teeth every 3-6 months. If you bottle feed your little one, it’s important to be aware this can contribute towards tooth decay. In particularly, you should avoid letting them use the bottle as a pacifier. So, don’t be tempted to leave them with the bottle at night time for example. It’s also a good idea to clean baby’s gums after a feed, especially before putting them to bed for the night as the liquid can lead to a bacteria and plaque buildup if it is left to fester all night. Unlike adults, baby’s mouths aren’t automatically rinsed by saliva, so you will need to wash away any leftover milk to prevent it causing future issues. Overall, baby gum care should ideally start from birth, but you won’t need to actually brush the gums until the first teeth start to come through. Cleaning baby’s teeth is actually pretty simple, but if you do have any questions or concerns, it’s worth asking your doctor or pediatrician for their advice. Many parents forget about the importance to start the gum care as soon as possible and to not wait till the baby is a bit older. You pointed that out very well. I’d probably wait too if I didn’t read a book about it during my pregnancy. The first toothbrush we bought for our boy was exactly the way you described it, a soft one with a large handle and small brushing head. You want to be sure that it’s soft enough and that it’s suitable for a baby – you don’t want it to be in pain because then he will always associate brushing teeth with it. Another thing that I feel like might be important to add is the choice of toothpaste. I think it’s better to use one of those kids friendly kind that has a nice flavor rather than a standard one. We bought a very light, strawberry flavored one and he loves it! This post just came in time. My baby has just turned 1 year old, and two teeth already popped up fully, and a few others are on their way. I have been wondering if I should get him a toothbrush. I am planning to make my own toothpaste, hope it’ll be better for the baby, as I’m going to use only natural ingredients. I am unmarried but this post will be useful to me after i have kids.Mother milk is good for babies. Are you sure we should brush our baby teeth as soon as the first tooth comes out? My baby is just four months and there are no signs of teeth yet and we are not cleaning his gums yet. However, we rub his mouth with a soft clean cloth after he is fed. What is the point of brushing your baby’s teeth where there are one or two teeth? Thanks so much for this interesting piece of information on how to take care of baby’s gums. Gums are very delicate part of a baby’s body especially before the teeth appears, so it requires proper attention in order to take a very good care of it. The point I find so helpful here is on the dangers of using a feeding bottle. Most African parents are fond of the habit of engaging their babies using feeding bottle. I’m truly glad to have stumbled across this article here, and I will surely pass it along to my pregnant kid sister, so that she doesn’t make the same mistake with her new born baby. We should really be careful when brushing a baby at the early stage of growth. Like you said, it is quite important we understand that the gum of a baby is not well developed at an early stage and that’s the reason we should take everything that is said in this article into consideration.